Winters on Long Island can be rough especially like the one we had last year. 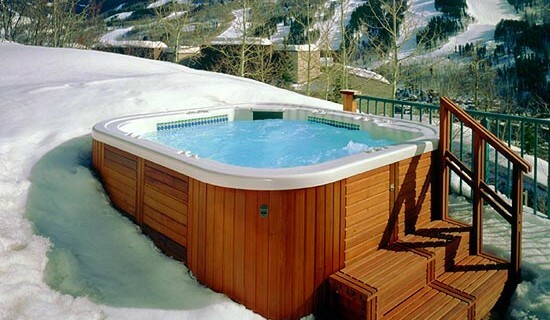 Once the season’s novelty of the snow has worn off and it’s a bitter 8 degrees outside, most people remain huddled up under mountains of blankets inside by the fire or TV, but you know there is another way to enjoy your winter days or evenings on the Island… in your hot tub! Its relaxing and therapeutic. Winter is my favorite time of year to use the spa. The chill of the January air makes the piping hot water in my spa feel better than ever. Whether you’re starting your day in the spa with a coffee, or ending your day with a glass of wine in the spa, hot tubbing in the winter is a wonderful experience. Below are some tips for enjoying your spa all winter long. Never turn off the power or heat to your spa with water in it. Water in a spa can freeze and cause your pipes to crack and burst. Burst pipes can cost thousands of dollars to repair. If you know you are not going to use your spa for a few days, you can turn the temperature to its lowest setting (in the 80’s or 90’s). Remember, the colder it is outside, the longer it will take your spa to heat up when you want to use it, so if you plan on using it on a Friday evening, set the temperature on Thursday. Check on your chemicals regularly. There’s nothing worse than getting ready to use your tub on a beautiful winter night and realizing you’re out of chemicals and the store doesn’t open until the next morning. Stock up and keep your chemicals in a dry place where they won’t freeze. The chemicals’ effectiveness is compromised if they are freezing and thawing. Don’t forget to maintain your spa. Even if you are going a week or two without using your spa because you were out of town skiing, doesn’t mean it can be neglected. Make sure you are checking your alkalinity and pH regularly and making adjustments as needed. Always adjust your alkalinity first. Have a friend stop by and check on your spa while they water your plants or feed the cat, or we can place you on a weekly, biweekly or monthly service schedule. Call now for any problems. Most people like to enjoy their tubs at night or on weekends and it might take us a few days to get to you, even in the winter. It’s no fun to head out to your spa for a weekend of relaxation on Friday night and not be able to use it until Monday or Tuesday morning. Clean your filters regularly. Once a week remove the filter from your spa and hose it down until the water runs clean. Spa filters should be replaced once a year. Don’t be fooled that they may look clean. Many people like to make it a part of their New Year’s or spring cleaning routines. Maintain the proper water levels. The hot water in your spa evaporates into the cool air, the colder and drier the weather, the quicker it evaporates. Maintaining the proper water level is essential to optimizing your jets and proper filtration. Having a hose hooked up all winter with a frost proof hose bib is a good way to ensure that you always have water for your spa. If you would like us to install a frost free hose bib for you, give us a call. It is helpful for not only cleaning your filter and cover, but also to top off the water in your tub. If your spa water level dips too low it can send the spa into a “safe mode” which turns the heat off and leaves you with a chance of freezing. Inspect your cover in daylight for any tears, rips, leakage or deformities. Properly maintained covers will not only keep the heat in, lowering your energy bill, but it will also protect the life of your spa. Winters can be especially tough on spa covers with storms blowing branches or leaves and debris gathering upon your spa cover. If your cover is getting too heavy (water logged) to lift that means has been breached and needs to be replaced. Also, after it snows remove the snow from the top of your tub to prevent snowmelt from ruining a cover. We provide various services which include treating your spa cover and side panels with a UV protectant. The protectant lengthens the life of your cover and cabinet and can help keep your spa looking great. But most of all, enjoy your spa! There is nothing more tranquil than sitting in your spa with a glass of wine or your favorite refreshment watching the snow fall around you.